Whether from a mobile phone, PC, laptop, hard disk or micro SD card, losing any kind of data is a nightmare for all. Similarly, losing photos can be equally an ordeal which is the best form of keeping beautiful memories alive. While it is quite possible that we hit/touch the delete button ignorantly and the photos get deleted, it is also likely that the device crashes due to hard disk failure, the memory card gets damaged due to mishandling, suffer phone damage etc., all leading to the loss of data. Fret not; as you can now easily retrieve your deleted photos with image recovery software applications which are absolutely free of cost. Using a strong recovery tool can help you get back your photos that consist of the best moments of your life. 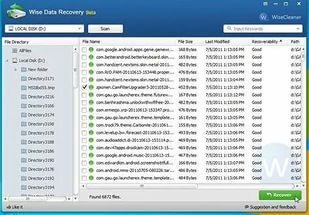 These applications work perfectly with Windows computers which help retrieve your deleted photos from varieties of media gadgets like, memory cards, external hard drive (pen drive), flash card etc. The applications also support many different file systems like FAT12, Fat32, etc., and various file formats. These tools are pretty small in size while downloading and installing does not take much time either. So hold your horses as we take you through the list of best free image recovery software for windows that will help you recover your lost photos in no time. Recuva is perhaps the most popular software for rapid recovery of your deleted photos. It offers an interface that can be easily operated and easy to comprehend. According to a test performed on the software recently, Recuva took flat 3 minutes to scan a 300 GB hard disk and recovered images from it. This software traces your treasured photos on your computer in minutes which were omitted in error. Not just the photos, Recuva also helps you in recovering any lost data like stored music, files, videos, and emails. However, the only point about Recuva that disappoints us is if the hard disk drive is completely damaged and Windows is unable to identify the disk, the software will not be able to scan it either. Therefore, in such cases, your data/photos cannot be recovered. Even though it is an extremely compact software that barely takes any space on your PC’s memory, Pandora Recovery effectively helps recover any of your deleted images. This software is absolutely free of cost and aids in retrieving images from the most form of media devices such as, pen drive, hard drive, MMC, etc., along with image recovery from file systems like NTFA or FAT. 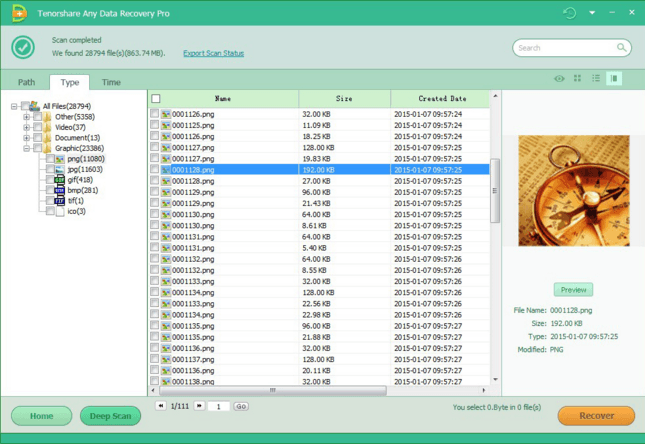 The recovery tool that it offers helps find the deleted photos and displays the thumbnail and additional details on typing the drive’s name. You can then select the images that from the list that you want to be recovered. 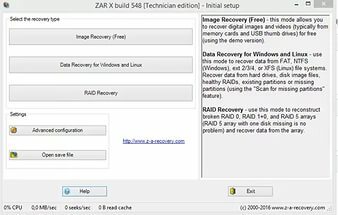 Zero Assumption Recovery or ZAR X as it’s called in short is a free software to help retrieve your photos that compete with Recuva’s performance with just one of its feature. Zar X can run a scan through even the completely damaged hard disk drives which is not a possibility with Recuva. On the other hand, it takes Zar X around 6 hours to complete a scan on a 2GB SD card which is a drawback compared to Recuva’s speed. While you can backup your image files and restore them with the help of the free edition, using the premium edition will allow you to retrieve other files also in addition to the deleted images. Another software that helps restore your photos along with other data free of cost is Wise data Recovery. It helps recover images from various types of media gadgets like MMC, pen drive, camera, hard drive, USB disk and more. In order to recover the lost images using this software, you need to go to the concerned drive, click on the scan option and it will display the entire list of images that have been deleted and that has the option to be recovered. Now you can choose the image files that you wish to restore to the desired location by clicking on the option that says “Recover”. CardRecovery is one of the applications that help recover your photos quite effortlessly; however, the only drawback here is that it takes as long as 40 hours to scan an SD card of 2GB capacity. On the other hand, what we love about this recovery software is that during the scan it flashes the all the lost data. So, if within the first few minutes of the scan if it flashes your lost photos you can just press the “Stop” button and restore the images. Also, it scans the corrupted hard disk same as Zar X which are not recognized even by the Windows. In addition, CardRecovery allows you to choose the exact type of camera from its settings hence, scanning from a specific brand of the camera becomes even easier. When you modify the settings to a different camera type, the file type also gets changed. Tenorshare is an efficient and free data recovery tool that allows you to restore your favorite images that got accidentally deleted or through any hardware malfunction. Using this tool you can easily recover your omitted photos from different types of media devices which include, camera, MMC, pen drive and more. Over 300 file types are supported by Tenorshare that also includes BMP and JPEG. It offers 6 different recovery methods of which you can choose the one suits your requirement. In order to recover the photos you need to select the drive by clicking on it, then select the Scan option and it will display all the omitted files classified by the type of the file. In order to be sure before you recover a specific photo, you can click open the photo and view it first with Tenorshare Any Data Recovery Free. 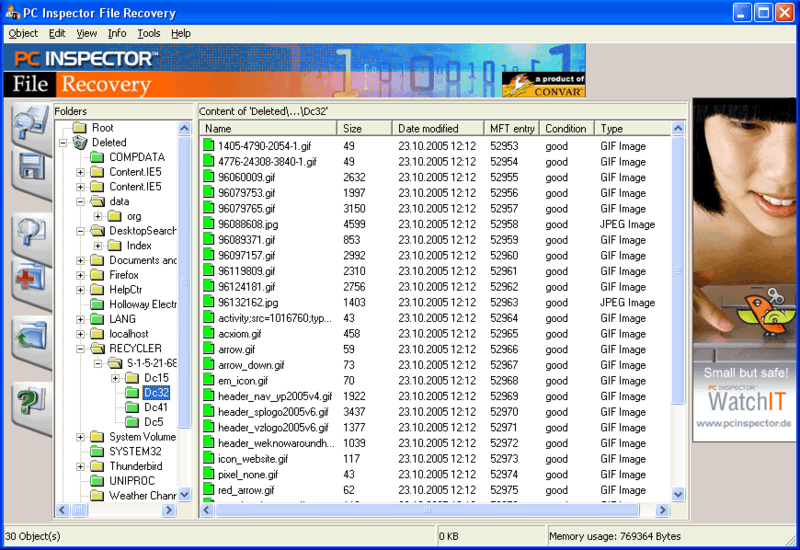 PC Inspector is another data recovery software available free of cost that restores your deleted images quite easily. While it helps recover your lost images effortlessly from the hard drive, it will not be able to retrieve any data from the damaged hard disk and which is not even identifiable by the Windows. Since this software requires some adjustments in its scanning process, the user, therefore, needs to be well-acquainted with some technical aspects. Hence, PC Inspector is not the right bet for the amateurs as they should be aware of the demarcation between the logical drive and the physical drive to initiate the scanning. However, the software definitely gets thumbs up in its scanning speed as it can scan a hard disk in flat 25 minutes. 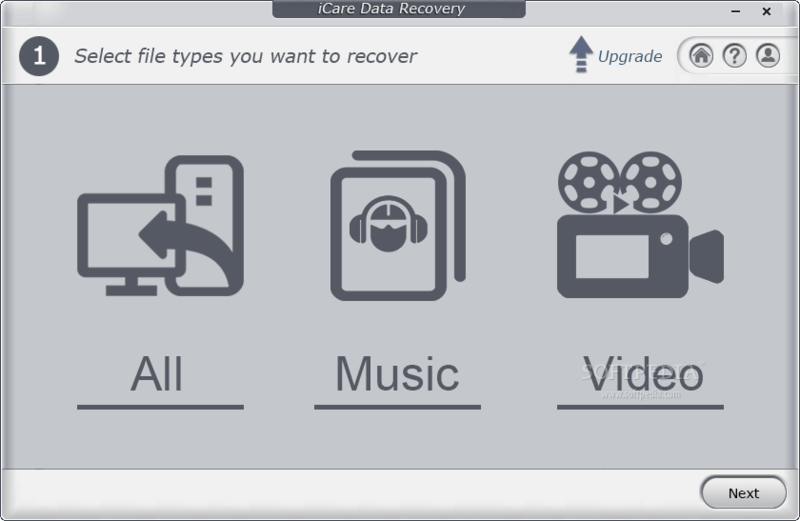 iCare Data Recovery free is another well-known software that lets you restore any of your images that have vanished due to formatting, any system error (virus infiltration, the crash of hard drive etc.) or when simply got deleted. It claims to recover unlimited data that have been lost. Apart from helping you to restore your deleted pictures, it can also restore other forms of data such as music, videos, emails, documents from any form of media device like, hard disk, camera, pen drive, USB, smartphones, and others. In order to restore the images, you need to choose one option out of the four that is listed on the home page. 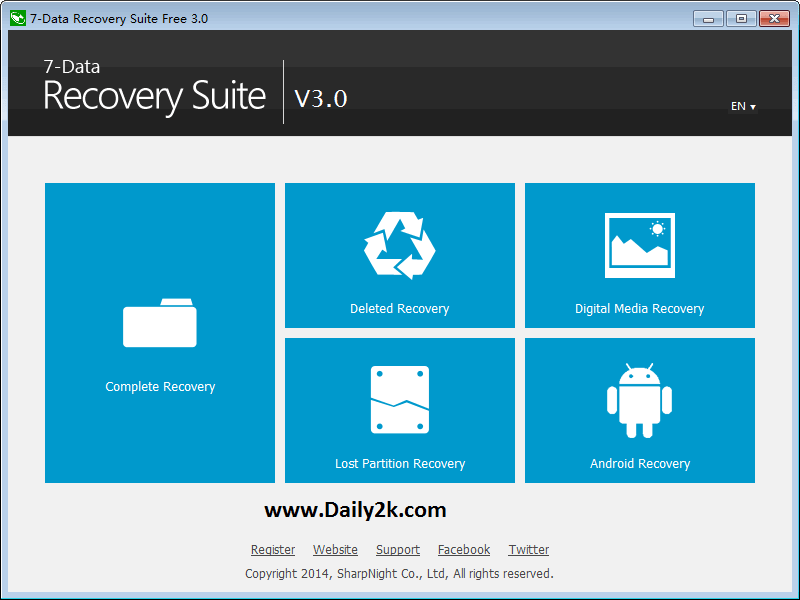 Now you can click on the specific drive and click on the option that says “Recover”. This will now look for all the files that got deleted from the drive and this process is time-consuming. iCare also allows you to select the type of the file as per your requirement which can be JPEG for example or any other format. You can then choose the location where you want the restored image files to be saved. The free version offers photo recovery up to 2GB. iCare Data Recovery is available for download on Windows Vista, Windows 7 and Windows XP. While most of the photo recovery tools need a card reader to retrieve the deleted images, Picajet breaks the rule by requiring the card reader to be present in the camera instead thereby, helping to recover the images. 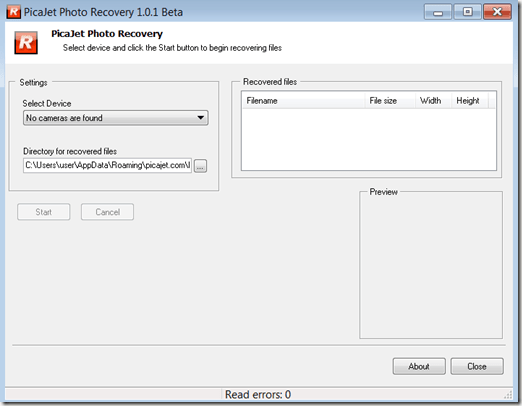 Picajet can recover image files easily if they have been omitted accidently or the card has been formatted. However, this image recovery software does not work with chips or hard drives that are completely corrupted. Remo Recover is one of the free image recovery applications that does a good job in recovering your photos that have been lost due to either by accident, deliberately or during the formatting process. It is one of the safest tools for image recovery and helps obtain lost files from all kind of media devices. It offers an extremely user-friendly interface, while the high-powered system design that cannot be modified do not interfere with the file data during the restoration process. It can extract files from all kind of drives whether internal or external such as pen drives, cameras, iPods, smartphones, USB drives and more, and support FAT and NTFS file formats. The tool first searches the entire hard drive for the omitted files and then displays the complete index of the deleted files. Here you can select the images that you want retrieve and choose the location where you want to save the data. 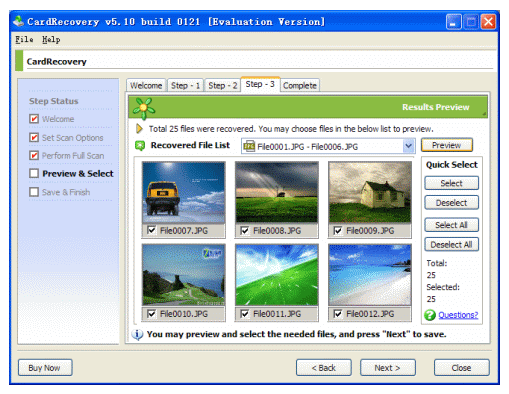 The free version of Reo Recovery offers image recovery of upto 1GB and is compatible with mostly all Windows versions. 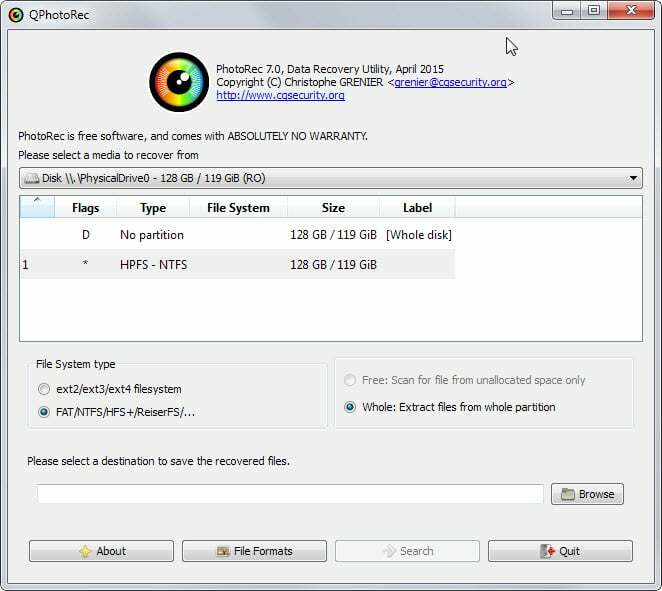 If you want to recover your deleted images comfortable, PhotRec is another data recovery software that can assist you to achieve this for free. It is an open source tool that helps extract image files from a host of media devices such as, hard disk drives, memory cards, memory sticks, MMC, USB drives, CD-ROMs and more. It supports most file formats that includes JPG and can also restore MP3 (audio) files, documents or ZIP files. In order to recover an image file, you need to first get the Zip file to the specified folder and then start the PhotoRec software. Now choose the specified drive and initiate the scanning and restoration procedure to the location where you want to save it. PhotoRec will efficiently retrieve all lost photos to the stated location. The software is compatible with almost all version of Windows that is, Windows XP, Windows 2000, Windows 2003, Windows 2008, Windows 7, and Windows Vista. Do not worry over your lost images anymore, as you have the 7-Data Recovery Free to your rescue. It not just helps recover your memories such as your deleted images, but also video files, other audio files, emails, etc., from various media sources like, pen drive, hard drives, MMC, USB drives or even from mobile phone devices. It offers five different types of built-in data restoration methods that assist in recovering image files that have been deleted intentionally, accidentally, due to corrupt files, formatting, malfunction or any other reason that you think of. You can select any one method of your choice for the recovery process. It displays the complete list of the deleted image files after the scanning is over for the specific drive. Along with the details of the deleted images you can also see the thumbnails which help you to choose easily. Now you can select the photo that you wish to restore, click on the “Save” option and choose the specific location where you want to save the image. It allows you to restore upto 1GB data in its free version. One of the other competitive tools is Glary Undelete that not only allows you to restore images but also lets you restore other files of different formats effortlessly. It offers a simple, orderly and a compelling interface that makes it an easily accessible for both the beginners and the experts, therefore, making it a great option to recover deleted photos. It allows you to restore images from different types of media devices such as, hard drive, USB drive, pen drive, memory cards etc., and also supports file formats like, NTFS, FAT and more. The scanning process is faster compared many other tools which take hours to trace the file. Glary Undelete also lets you search for explicit file types by setting them to JPEG for example. 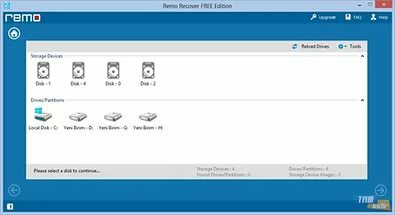 Once the software finishes scanning the drive and displays the files, you can then choose the exact file that you want to recover and select the option that says “Restore”. Glary Undelete is compatible with a majority of the Windows OS. However, the only two negatives of this software are that it needs to be necessarily downloaded and installed on the hard disk as there is no compact edition available for the same and while its installation it tries to setup other unknown programs, which is quite irritable. With the help of Orion you can recover lost files from your hard disk or from any other compact or external drives connected to your device. Overwritten files can be either be deleted forever in order to rule out any future restoration or can be restored if not overwritten. Among the files that it can restore are images and audio files, while it also scans your hard disk drive, flash and external drives, and deletes the file forever to ensure maximum security. You need to open Orion File Recovery using a wizard, which takes you through the entire procedure to scan and restore files or erase files forever. Once the scanning process is complete, the wizard or the interface displays the index of all erased image files. You can now select the desired file and restore the image by clicking on the option that says “Recover” and save it to the preferred location. Additionally, it searches for more files using deep scan method, allow you to search using different filters like type of file, type of folder, folder name, etc. Cleans different drives like flash drive, hard drive and more, and supports different file formats such as FAT, NTFS, etc. Orion is compatible with Windows 7, Windows 8, Windows XP, Windows Vista, Windows 8.1, and the latest Windows 10. Data Trace Recovery is an extremely user-friendly and competent image recovery software that helps restore your cherished images in the most secured way. You do not require any technical knowledge to access the interface due to fuss-free arrangement. The tool helps you to restore not only images but also videos, audio files, emails, documents and more from media devices like cameras, pen drive, USB drives, mobile phone devices, hard drive, etc. It also does a great job recovering lost files due to formatting, during unformatting, files which are deleted accidentally, intentionally, malfunction, corrupted files, crash, and due to any other reason. You can restore files directly using the last search results, view some file types in advance like zip, audio, rar, video or pdfs. Scanning process is faster compared to others in the category, scans even the unreachable locations, you can modify the type of scan using the add button ore the delete option, can be used by both home and enterprise users, users can upgrade to any edition using various license, supports hard disk space as large as 8T, and can add two different modes such as, list and split-window to view in advance. If you have already scanned through the specific drive from where the files have been deleted, you can then make use of “continue recovery method” to be double sure. For a casual search of files by category you can use “Search lost files by type”. You can restore the files and save them to the preferred location by specifying the path. The free version offers recovery of lost files up to 1GB and works with most of the Windows versions. DataRecovery is a software that allows you restore images and other files that are lost or erased. It is a portable tool, hence does not require any installation. This means it enables you to add it to a portable device and straightway execute it on a workable file on any PC without any modifications to your Windows registry access. It offers an extremely simple and user-friendly layout which lets you choose the specific drive and start running a scan easily. However, in cases where you want to run another scan, you can let the tool to run a complete scan to be double sure. The list of the files detected shows the file type, size, and path along with modification date and characteristics of individual files. You can also use a search feature by adding the entire file name or simply a part of it, change file names and even erase them forever. In order to recover a file, go to the specific drive, select it, and the set the filter for scan to JPEG for example and start the scanning by clicking on the scan option. The files can now be selected and recovered to the preferred location of the computer. DataRecovery runs a fast scan compared to others in the category for which it uses a huge amount of system support. However, a complete scan does not require a large amount of system support and hence, this scanning procedure takes a long time to finish. The only point where it disappoints the user that it lacks advanced settings hence, it cannot search for a specific file or its format with a specific creation date. Undelete 360 is one of the finest tools that helps you to recover photos that have been deleted from your computer accidentally or intentionally, irrespective of the media device type. The program allows you to browse through, search and then restore deleted files swiftly as it is built on an extremely speedy and productive design. The files that you recover could have been deleted due to any reason ranging from accidental reasons to a software or hardware crash and others. It can help you restore deleted files from memory cards, hard drives, USB drives, smartphones, pen drives and other devices. Both folder and file recovery is supported by Undelete360. While it allows you to scan specific drives for erased files, it also organizes the results by the type of files. Go to the window on the right-hand side, select the desired file which you want to recover and click the recover button. Now transfer it to the desired location and save it there. WinUtilities Free Undelete is a compelling tool that helps you recover your lost images effortlessly. It also lets you restore other file types like audio files (MP3) and video files (AVI) while in advanced scan state. It can also restore lost data on FAT and NTFS formats or on any substantial storage medium. It also allows you to preview the photos before you recover along with binary files. This program can also help you get back those images or data that have been deleted in error, or due to the formatting of the memory card in a camera. In order to retrieve the lost files got to the specific drive that you wish to scan and select it. This will start the scanning automatically and displays the results in a jiffy. Now you can chose the photos or the file from the list, click on the option that says “Undelete” and it restores your photos or files to the preferred location. 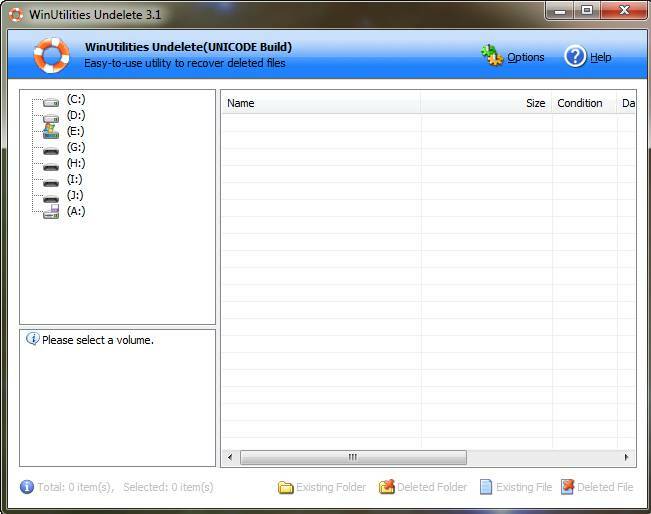 WinUtilities Free Undelete overall very easy to use and is compatible with most of the Windows OS versions. If you your crucial data s deleted in error or due to hardware crash, fret not as Recuva helps you to restore your lost files from your recycle bin, audio system (MP3), camera or from your Windows PC in no time! The software’s interface resembles a wizard where you can choose images, audio, videos, emails, documents or other file types for scanning effortlessly. You can even restore from any type of media that can be overwritten such as, USB drives, external hard drives, MMC and more. The best part about Recuva is that, it also allows you to restore files even from corrupted hard disks or drives that have been freshly formatted. Its avant-garde deep scan mode minutely scans your drives to find any hidden files that have been erased. 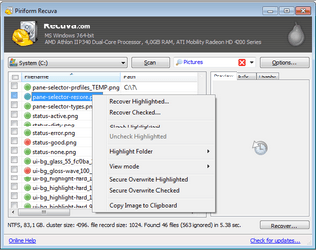 For some files that are better deleted, with highly advanced military techniques Recuva ensures that such files are permanently deleted. Additionally it also allows you to see the preview of the photos before you go ahead to recover. It also lets you select the photos quite easily, that you want to restore. You can restore the images to the preferred location with equal ease. Undela is a program that can help you restore deleted photos and files from all types of external and internal memory. It is data recovery software that helps you to recover lost images, emails, videos and more from different media devices like, Flash drive, hard drive, memory sticks, USB drives, etc. However, the program runs a bit slow as it can scan individual portable device or drives individually and not all at once. There are three different types of scan modes that are, simple, full and advanced scan which is based on the time when the file that you wish to restore was last deleted. Here you need to select the file type manually from the “Options” list in order to restore it. While it the scanning speed may also depend on your PC’s speed, the full scan mode is comparatively slow than others in the category. Once the scan is over the program displays important details of the restored file such as, the date when it was created, file name, last date when it was changed, size of the file, etc. Undela offers a user-friendly interface with big enough buttons, however they cannot be customized or modified.